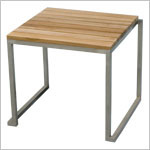 The Moby Series is characterized by its slim and sleek lines made possible through the use of stainless steel and teak. Its understated elegance is functional and sophisticated at the same time. The beauty of the design is topped with high quality hand crafted construction. The Stool is designed with a large seating surface and is also stackable for storage. Also perfect for use as an occasional table.